A retired law enforcement professional based in New York, Phil Pulaski began his career as an engineer after earning a master of science degree in environmental engineering from Manhattan College, Bronx NY. Mr. Pulaski worked as an engineer for 4 years with the US Environmental Protection Agency at a time when the new agency was focused on cleaning up the nation’s air and water. 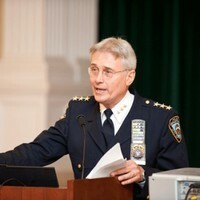 Phil Pulaski subsequently joined the New York Police Department (NYPD) launching a career that lasted more than 3 decades. During this time he supervised numerous high profile cases including the 9-11 World Trade Center attack investigation and October 2001 Anthrax weapons of mass destruction investigation. In May 2012, Phil Pulaski’s team of investigators solved the famous 1979 Etan Patz missing person cold case and arrested Pedro Hernandez for the murder of Etan Patz. Hernandez was subsequently convicted for the murder. Phil Pulaski retired as Chief of Detectives in 2014.